Jump to the "Extra Features" menu. Arrow down to the "Main Menu" selection and press your Down button once again. A hole in the floor will highlight, then click. 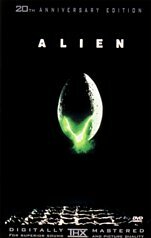 There's an in-depth analysis of the Alien Lifecycle. If you've never seen the movie before leave this one hidden feature till last. It's certainly a spoiler - complete with warning! Again from the main menu use your remote to highlight "Scene Selection" then press your Right button. Press your Enter button and you'll be taken to the 'USCSS Nostromo flight plan' complete with crew manifest. From the main menu use to highlight "Extra Features" then press your Left button. Press your Enter button and you'll be taken to the DVD credits menu.